There is another aspect of the IPCC WGII report's misrepresentation of disasters and climate change that is worth relating. Earlier I documented how the IPCC selectively used a background paper prepared for a workshop that I organized in partnership with Munich Reinsurance in 2006 to argue that there was a relationship between human-caused climate change and the growing toll of disaster losses. The IPCC showed that relationship quite explcitly in its Figure TS 1-1, shown below. The reference in the figure caption is to Muir-Wood et al. 2006 (the background paper to our workshop is here in PDF). That paper was not published by the IPCC deadline for inclusion, nor was it peer reviewed, nor did it include the graph shown above, nor did it strongly support the claims being made. But it was highlighted anyway. 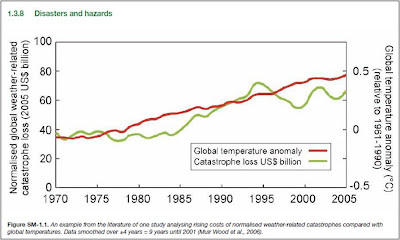 In sum, we found limited statistical evidence of an upward trend in normalized losses from 1970 through 2005 and insufficient evidence to claim a firm link between global warming and disaster losses. So to summarize: Contrary to its procedures the IPCC chose to emphasize a paper that was not peer reviewed to support claims that were contrary to all of the peer reviewed literature on this topic. The IPCC created (or had others create) a graph that appeared nowhere in the literature and was highly misleading. When the paper was eventually published several years later as a book chapter, it was revised in such a substantial fashion so as to eliminate unambiguously any basis for the claims that had been made by the IPCC justified by the earlier version of the paper. 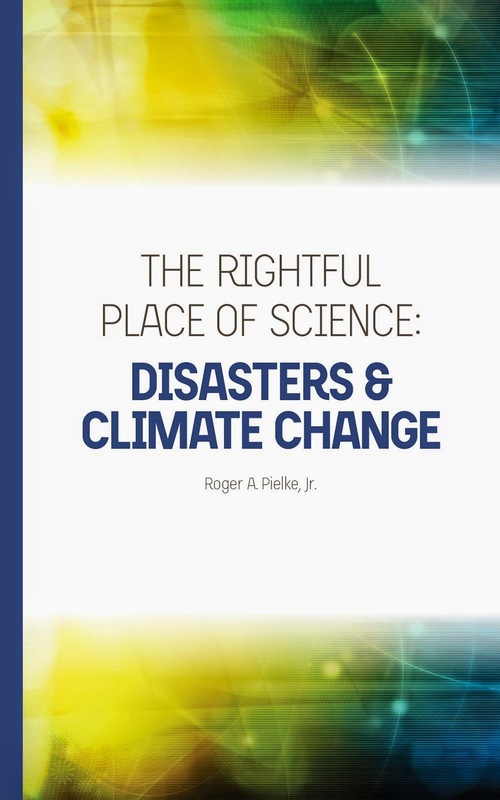 The claims made by the IPCC about the relationship of disasters and climate change, expressed most clearly in the figure above, were not simply made in violation of IPCC procedures. The claims were not just wrong. The claims were based on knowledge that just doesn't exist. Again, not good.